Intraday trading time analysis: When and how to execute trades? Know about the best time frame for Intraday trading, which will help you understand how to place intraday trades on Indiainfoline.com. Did you know that intraday trading time matters a lot in intraday trading? Intraday trading time analysis is all about understanding the intraday trading time frame and then working out how to place intraday trades accordingly. Most of us tend to treat charts as generic timewise information, but there are a lot of sub-divisions that break up the trade based on the intraday trading time frame. For example, the simplest chart used in intraday trading is the daily chart (which is at a one-day interval). However, for more granular traders, there are hourly charts, minute charts, and also tick-by-tick charts to identify and trade much shorter duration trends. Let us see how to use intraday trading time analysis and their application in execution of intraday trades using timewise charts. In an hourly chart, the intraday trading chart is further broken up into hourly segments and the high, low, and median price is plotted for each of these hourly intervals. For example, one can use candlesticks to represent the opening, high, and low of each hourly interval. What is the application of such charts? They can be used for trading very time-specific trends. For example, the first hour and the last hour of trading happen to be more volatile, while the middle hours tend to be more stable. Hourly charts can be used to trade such unique hourwise characteristics of intraday trading. Hourly charts also rely on volumes and volatility to take a more informed view. What is the trading application of 15-minute charts? These charts are plotted over a period of 3-4 hours or through the day, the only difference being that the stock price is broken up into 15 minute segments. These charts can be used to identify very short-term trends in the market. These charts are normally studied in tandem with news flows and volume changes. When studied over a longer period of time, they give useful insights on how to take intraday positions. Intraday trading is all about moving your money in and out of the market with a positive risk-reward ratio in each trade. Very short-term trends can be captured by these 15-minute charts. They also capture the opening, closing, high, and low prices at 15-minute intervals for a stock or even for an index. These charts are normally used by very short-term traders. 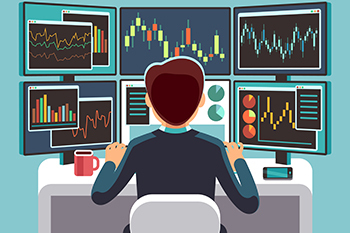 When we talk of 5-minute charts or 2-minute charts, the actual time frame for analysis can range from a few trading hours to even a few trading sessions. This is the interval of prices that are considered. For example, the 5-minute chart plots the open/high/low of the stock price at 5-minute intervals. This chart is very commonly used by intraday traders as it gives them signals of breakout on a very short-term basis. The idea is to quickly move in and move out of a position so as to end up with a net profit after considering all the costs. Quite often, stock prices give scalping opportunities which last for a period of few seconds to a few minutes. The slightly longer end trading signals can be captured by these 5-minute charts. At times, even traders using day charts use the 5-minute charts for granular confirmation. A shorter improvement to the 5-minute chart is the 2-minute chart. It depicts the price movement over a few hours during the trading day. In this case, each candlestick shows the opening, closing, high, and low at two-minute intervals. This chart is very useful for traders who are looking at extremely short-term opportunities but work best in case of highly liquid stocks. Also, such trades need to be executed in volumes to be really profitable. A tick is a price point irrespective of whether it occurs in a millisecond, microsecond, or in a minute. A tick-by-tick chart can only be used where the stock has very high levels of liquidity and shows distinct trends in the very short term. These line charts represent every trade executed on the stock market. Here, every tick refers to a trade actually executed in the market and not just an order placed. The tick-by-tick charts of highly liquid stocks show constantly moving ticks. These charts will also work best for expert intraday traders willing to trade on large volumes and small spreads. Most intraday traders refer to tick-by-tick charts as an additional data point. Intraday traders normally select the chart best suited to them based on their risk capacity and level of trading expertise. Time charts are, thus, staple diet for intraday traders!